Rankers Hub is an educational Institute specially for CA,CS ,Commerce & Law Classes . The Institute was started in 2013 by Advocate Khushboo Jain. We Have 5 years of Educational Institute Experience. 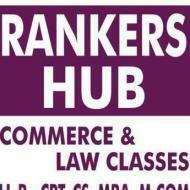 Rankers Hub conducts classes in BBA Tuition, BCom Tuition and CA Coaching. It is located in Aundh, Pune. It takes Regular Classes- at the Institute.